Fruit that fails to mature, that drops off when very young or that just fails to eventuate could be from too few pollinators in your garden. Because of the pollination services they provide, bees are responsible for 1 in every 3 mouthfuls of food we eat. 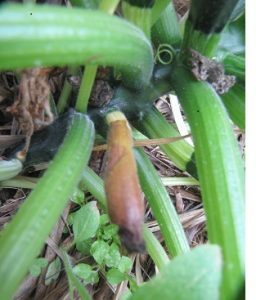 I’ve spoken to gardeners who nurtured their zucchinis lovingly only to have the little fruits turn brown at the blossom end and drop off after only a week or two. It happens just when you are planning what fabulous zucchini meal you’ll dish up. Ah, sad, thwarted by a sterile fruit! Many years ago, I used to whip out into the dewy morning garden in my bare feet to pollinate the female zucchini flowers with a feather or a paint brush dipped in pollen from the male flowers. Not any more. 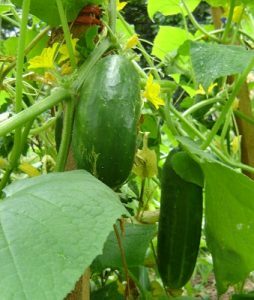 Cucumbers (pic below) and and melons in the summer are other examples too. Huge vines with very few fruits. So sad. And do you have fruit trees like mangoes and tropical stone fruits that are laden with flowers, only to have them all drop off and a teeny tiny number of fruit develop? While there are a number of reasons for the poor show, I’ve found a key factor is lack of pollination. Many of your neighbours may be using wide acting insect -killing insecticides in their gardens for aphids, scales and caterpillars. These have the flow-on effect of killing bees too. And, with a dearth of wild gardens and mature native trees in suburban areas, native stingless bees are less often seen. Potentially, they do a wonderful job in pollinating our gardens, if they are in the vicinity… So, one result of tree clearing and broad-scale insecticide use can be that our vegie and fruiting plants suffer. What to do? I must say that since I bought our first hive of native Australian stingless bees (Tetragonula carbonaria) about 11 years ago, I’ve had to do very little hand pollinating of our vegies or fruits. These tireless little workers , smaller than a European honey bee, smaller than a fly and about the size of a ladybird, buzz around the flowers in the vegie garden transferring pollen from flower to flower. 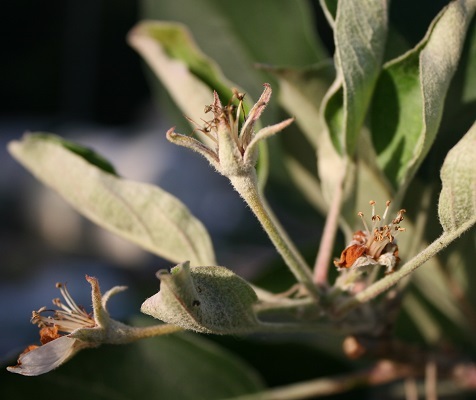 They love fruiting trees too and can be seen rolling in the nectar-filled flowers of the tropical apples in late winter. Thanks little bees. That ensures a good pollination and a healthy harvest for us! Would you plant flowers for stingless bees? In your garden you can attract stingless bees by planting companion flowering plants with smallish open flowers around the perimeter or nearby the plants that need pollinating. I run a whole course on companion planting and providing food for beneficial insects. But let me say right now, that I would never have a vegie plot or a fruit orchard without nasturtiums, Queen Anne’s Lace and German Chamomile. These are sensational stingless bee attractors. There are lots more bee forage alternatives too, including of course, native plants especially suited to your area. But why not pop into a Stingless beekeeping course here at Ecobotanica? I run a number of classes each year about the time I split the hives. You’ll learn how to split the hives, how to care for your hive in a box or tree if you have one, how to identify the bees so you don’t mistake them for pests, and lots more interetsing things about Stingless bees. You’ll even get to taste the wonderful native sugar bag honey these bees produce. It’s raw, pure and fresh. There’s not a person I know who hasn’t been awestruck by the taste and wonder of it all. So, join a class. It’s not too early to book. 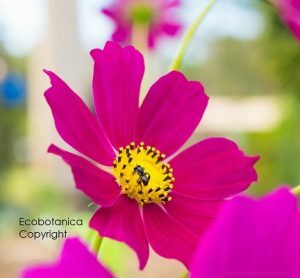 Click here to check the class list for the next Stingless Bee Class here at Ecobotanica.